Epiphytic plant. Stem short, robust, completely enclosed by imbricating leaf-sheaths. Abundant roots, fleshy, glabrous, with purplish tips. Leaves fleshy, uniform green above, with more or less purplish relestion below. Very variable in size, 20 to 40 cm long, 5 to 8 cm wide. Elliptic or oblong-elliptic, oblong-ovate to oblong-oblanceolate, acute or obtuse, rarely rounded. Flower stalk much longer than the leaves, 60cm to 1 meter, arcuate, more often simple, occasionally branched, brown-purplished dotted of green. Bracts of 5 mm, broadly triangular. Flowers showy, white. Sepals very spread out.Dorsal sepal oblong to ovate-elliptic, lateral sepals divergent, obliquely ovate, delicately careened at the lower face. Petals largely rhomboid very obtuse twice broader than the sepals. Lip much smaller than the sepals, deeply 3-lobed, with the callus and the basal part of the lateral lobes tinted of pale yellow on each sides, punctuated and suffusionned of purple. Lateral lobes erect with cuneate base,curved, largely oval. Midlobe, largely hastate with broadly triangular acute lateral laciniae. Apical portion of the midlobe bearing two long and flexuous cirrhis. Peak of the bilobate callus, with digitate lobes , yellow and spotted of red. Column short , round, white. Pedicellate ovary of 3,5 cm. Flowering is possible all year, but more frequent in culture in spring. Phalaenopsis Aphrodite had a natural area of distribution much more restricted than that of Phalaenopsis amabilis. It practically disappeared from nature in Taiwan. The first European to defer the existence of Phalaenopsis Aphrodite is a Jesuit, Georg Joseph Kamel (1661-1706). Joigned in the orders in 1683,he was sent in the islands of the South-East Asia. With its talents of botanist he added an artistic direction and he became the first plant specialist of the Philippine Islands. In good place in his work Phalaenopsis Aphrodite appeared described with the language of the XVIIth century like a dove. 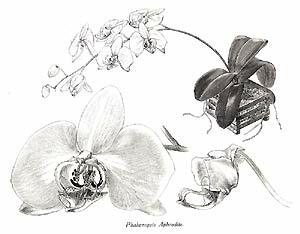 Work of Kamel was neglected by Linne and Phalaenopsis aphrodite did not appear in the first list of orchidacees in his "SPECIES PLANTARUM". Rediscover in 1836 by Cuming which sent it in 1837 to Rollisson, English horticulturist who made it flower in the autumn of the same year. Lindley mistake this species with Phalaenopsis amabilis. When ten years later true Phalaenopsis amabilis was introduced in its turn, Lindley believed it has a new species which it named Phalaenopsis grandiflora. 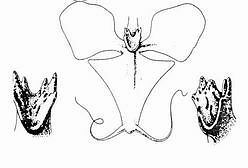 This double error was propagated in many orchids nursery and even in certain works, although the situation was rectified and clarified by Reichenbach since 1862. 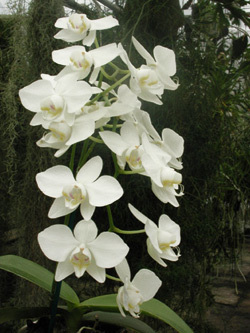 Aphrodite, all the white varieties thus go down officially only from Phalaenopsis amabilis. Endemic of Taiwan (principal island more Babuyan, Lan-Yeu, Lu-Cat). Green apple foliage , flowers smaller than the type, but more numerous on a very ramified floral stalk. Largely multiplied for flowered plant.